While it still is Google performing the searches for the Apple iPhone's 4.0 beta OS, you couldn't tell by looking at the keys on the phone. Where once the blue button pressed to begin the search said "Google", it now simply has the generic term "Search" written on the key. 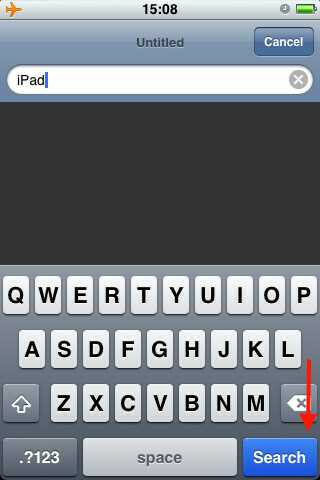 Speculation is high that Apple will replace Google as the iPhone's default search engine with Microsoft's Bing. Those that believe that this will take place see it as the Cupertino gang giving a spanking to the Mountain View based company for Google's last second steal of mobile ad firm AdMob away from Apple. Of course, that could be too much of a Freudian analysis for what could be a simple business decision. Apple wouldn't take the power of the iPhone and use it for evil-would they? Upsetting Google might not be the best strategy for Apple as the iPhone still uses Google Maps and the iPad comes equipped with a freshly updated YouTube client. I am happy for you: must be nice to be able to carry a netbook every where you go. Whats your point. Search is a very big part of our world whether you like it or not. I would personally use the iphone as a shim to level my dinner table however whether old news or new i can respect certain significance.